Over 290 organisations use the Open Data Pathway to benchmark their open data practice and develop plans to improve. Stephen Gates shares how its new feature allows new analysis around how well organisations and countries do, internationally. ODI Queensland is an ODI Pioneer Node in Australia. 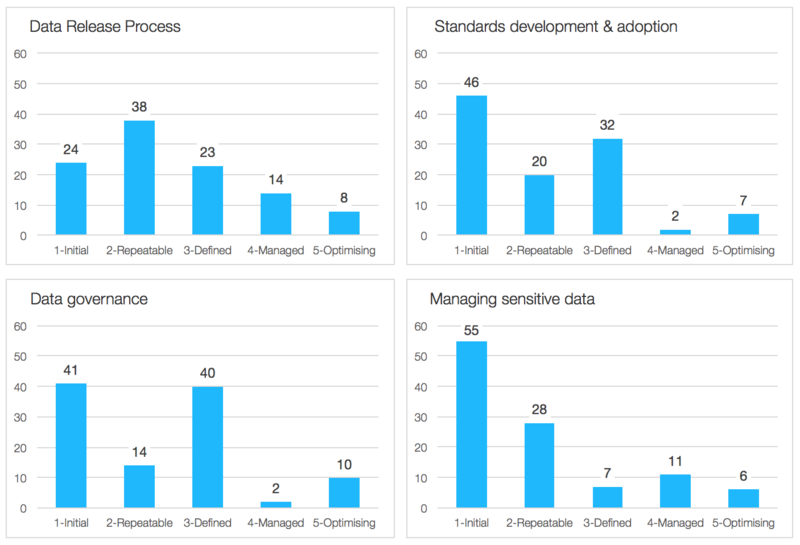 We provide an Open Data Maturity Assessment service to organisations wanting to benchmark their open data practice and develop an action plan to improve. The service is based on the Open Data Maturity Model and through a series of workshops we assess how well an organisation publishes and consumes open data. Results are recorded in the Open Data Pathway. The reports we deliver include a collection of charts that show the organisation’s position compared to other organisations using the Open Data Pathway. We use the data downloads available in the Open Data Pathway to produce the charts. So far, over 290 organisations are using the Open Data Pathway and over 100 assessments have been completed. The statistics provide a great source of data to assess the state and progress of open data practices globally. Existing Open Data Pathway users are encouraged to sign in and ‘add country’ to their accounts. All open data producers are welcome to register and use the Open Data Pathway to assess and track their open data success. Country-level statistics were made possible by the Queensland Cyber Infrastructure Foundation. QCIF provides high-performance computing facilities, big data infrastructure and software services to Queensland researchers. QCIF connects universities, industry and government together to collaborate on innovative computationally-based projects. QCIF are a supporter of ODI Queensland, who coordinated the project. Many thanks to Gavin Kennedy, Andrew White and Matthew Mulholland from QCIF for their contributions and to Leigh Dodds and ODI Labs for their support. Stephen is a volunteer at ODI Queensland. Follow @ODIQueensland on Twitter.